Duck and chicken eggs are different inside and out. You can't see the nutritional differences -- duck eggs have more omega-3 fatty acids, for example -- but you might taste a difference. If you pay attention to size, color and texture, you can distinguish between duck and chicken eggs. The first thing to look at when comparing duck and chicken eggs is size. Egg size is determined by a variety of factors, including how much protein is in the bird's feed, how much the bird eats and, most importantly, the bird's size. Generally, ducks lay larger eggs than chickens because they're bigger birds. A large chicken such as the Rhode Island Red will produce jumbo eggs -- however, an egg from a large duck, such as the white Pekin, will best the jumbo chicken egg in size. If you put a chicken egg in one hand and a duck egg in the other, you'll likely notice the duck egg feels heavier, even if the two eggs appear to be the same size. The thicker shell and larger yolk gives the duck egg a little extra heft. The duck egg also looks and feels smoother on its surface than the chicken egg, which doesn't have the slick finish the duck egg has. 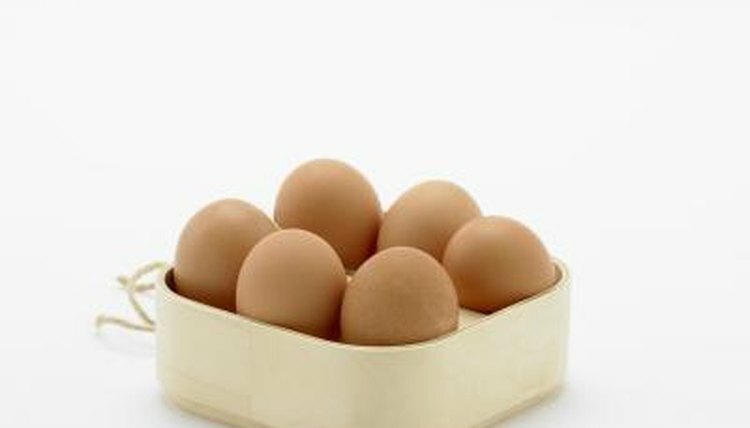 Color can sometimes help distinguish what kind of egg you're looking at, though both birds lay eggs of varying colors. Duck and chicken eggs range in color from white to cream to light green and blue, to various shades of brown. The black Cayuga duck even lays black, gray and white eggs. If the idea of blue or brown eggs turns you off, you can eliminate the chance you'll get anything other than white eggs by choosing a breed of duck or chicken known for laying white eggs. You'd want to avoid the Rhode Island Red hen, who produces brown eggs, and stick with something like a white Leghorn, who lays white eggs. The Pekin duck will also give you white eggs, while the Rouen carries the risk of leaving you with eggs tinted bluish-green as well as white eggs. When you crack these eggs, you'll notice the duck egg is a tougher egg to crack -- the shell doesn't break as easily as the chicken egg, because it's thicker. The thicker shell gives the duck egg a longer shelf life, lasting up to six weeks in the refrigerator. The duck egg's yolk is not only larger but also a more vibrant orange color than the chicken egg. The white of a duck egg is a bit different, too -- it has a little more structure, meaning it stands up better and doesn't ooze outward so much when the egg's broken open. My Pet Chicken: Chicken Help: How Do Brown Eggs Become Brown (Instead of White)? Indian Runner Duck Association: Runner Duck Eggs -- Mike Ashton Asks: What Colour Should They Be?